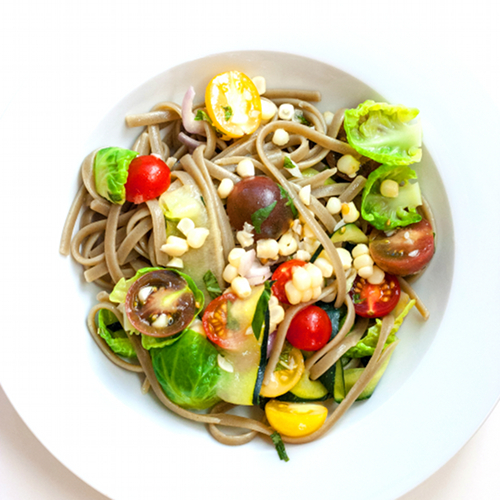 Fresh farmers market acquisitions really shine in this simple, healthy and delicious pasta dish. In a large pot, bring water and salt to boil. Cook corn in the pot until tender, remove and set aside to cool down. Cut corn from cobs. Cook pasta according to directions. 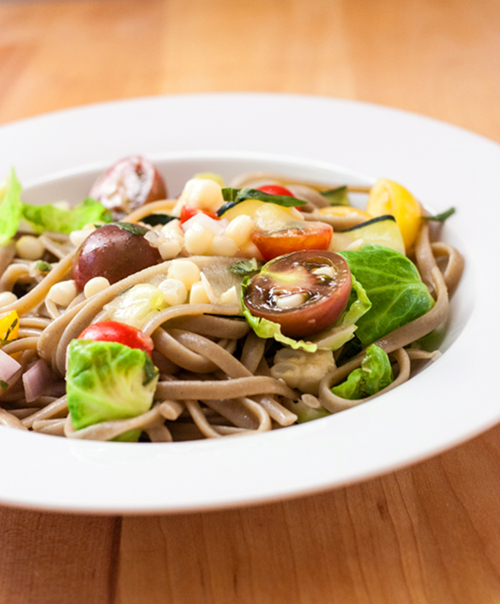 While pasta is cooking, mix garlic, lemon juice, and olive oil in a large mixing bowl. When pasta is done cooking, remove from the pot, drain completely and transfer to the mixing bowl. Using the same pasta water, cook brussels sprouts and zucchini strips for about 15 seconds. Remove and drain, add to the mixing bowl. Add corn, tomatoes, red onions and herbs into the bowl. Season with salt and pepper. Toss gently to mix. Serve pasta with shaved parmesan.